Several years ago - right after we got chickens and were starting up a garden - I asked my husband for wood chips. I sold him on Square Foot Gardening and the Back to Eden method. He made garden beds from scratch. And I had a list a mile long of requirements for wood chips. "No black walnut! Hardwood only! NO PINE!" Finally he'd had enough and called someone to dump a pile right off the road to the side of our house. Happy Mother's Day to me that year, indeed. But I wanted to stress about it because I didn't know if it met all my restrictions. 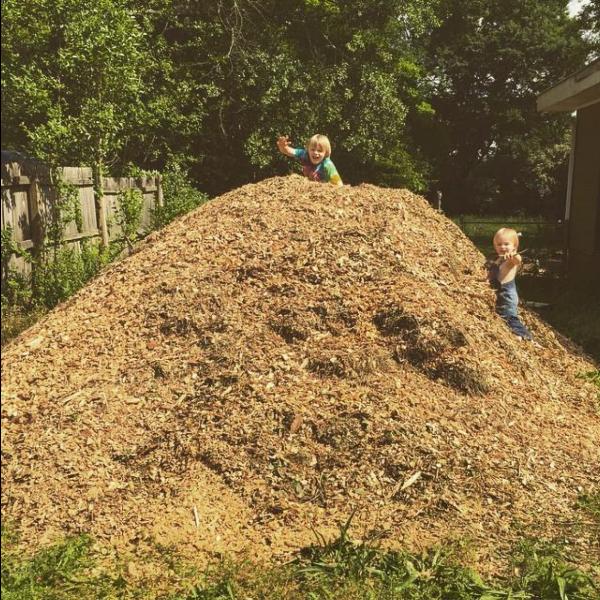 A beautiful pile of wood chips, am I right?! Oh, and those boys ... pretty cute, too. Three years later and that pile of wood chips is almost gone. We used it in our chicken coop every time it rained (it was FANTASTIC at absorbing water and feces and keeping the coop smell-free), we spread it all in the yard to combat the catsear (which is crowding out my dandelion), and we used it in the garden. What's left in the original spot from the bit we didn't use is incredible dirt. Recently, I stumbled across this resource from Washington State University Extension: Using Arborist Wood Chips As Landscape Mulch. The copyright date is 2015 - the year I got my big pile of wood chips. And now, three years later, all my questions are answered. Spoiler Alert: I worried over nothing.